Some people love the hot coffee. Love the hot. People order their americanos “extra hot” so the baristas will put out water at higher than the 180 degrees they aim at. Madness! Personally, I have to let it cool down a bit — but ideally, you want to drink the coffee as soon as possible to get the full flavor. Enter the Coffee Joulie. It’s a stainless steel bean, as you can see, and sealed in the middle are five ounces of a special material that melts at 140. 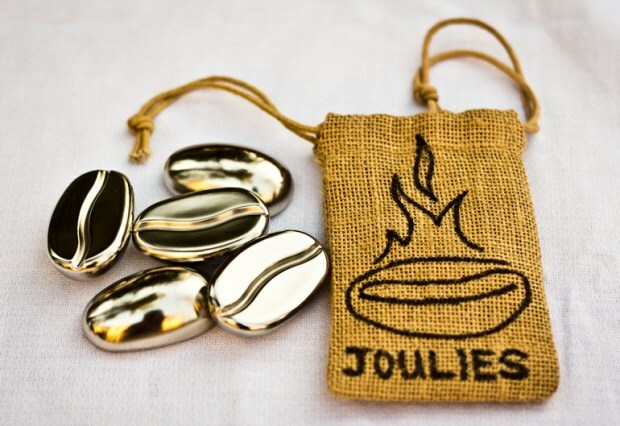 Put a Joulie in your coffee, and it’ll absorb the excess heat and bring it down to drinkable temperature — and then as it drops below 140, the material releases its heat energy again, keeping your drink hot longer. So it’s a fancy rock, basically. That’s not a bad thing — they’re customized to maintain the perfect temperature and you can use more than one if you want to cool it down faster. The immediate concerns I have are safety, taste, and my teeth. Safety is taken care of: they assure us that not only is the material non-toxic, but it’s totally sealed within the stainless steel shell. Taste is a little harder to say — will stainless steel affect the taste? Maybe not by any large amount, but I’m guessing (even if it’s psychosomatic) that some coffee snobs will say they can tell. 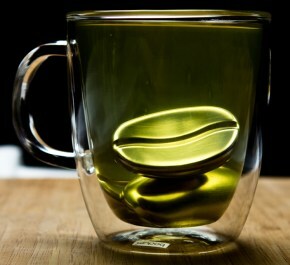 And as for my teeth — well, it’s a big piece of stainless steel in my cup, what if it comes crashing down on my face? Reservations aside, this seems like a cool idea. Check out their Kickstarter page for more info and drop a few bucks in the jar if you want to see these things made a reality.